New Visual Studio C/C++ users sometimes get tripped up by IntelliSense errors, so today I’ve decided to share the secret, undocumented solution: just turn them off! IntelliSense is a nice user interface feature when it works, but it has nothing whatever to do with building and running your C/C++ code. IntelliSense errors do not equal compiler errors, and trying to “fix” them is fruitless. Simply right-click anywhere on the Visual Studio error list (the click must be inside the list, not outside), then uncheck “Show IntelliSense Errors”. Problem solved! There is one small irritating issue with this solution: your setting is not persisted in the registry, so the errors have to be turned off every time you start Visual Studio. Recently I had to debug an intermittent access violation exception in one of my AutoCAD plug-ins. I needed to get the exception while the debugger was attached so I could break the process and analyze the state of memory before AutoCAD’s global exception handler got control. Unfortunately, sometimes it took several hundred runs before the exception occurred. To make matters worse, AutoCAD was throwing exceptions on shutdown that had nothing to do with my code. If I started AutoCAD manually under the Visual Studio debugger, I had to dismiss those shutdown exceptions manually every time. I needed a way to script the task of starting AutoCAD under the debugger hundreds of times in a row until the exception finally occurred. 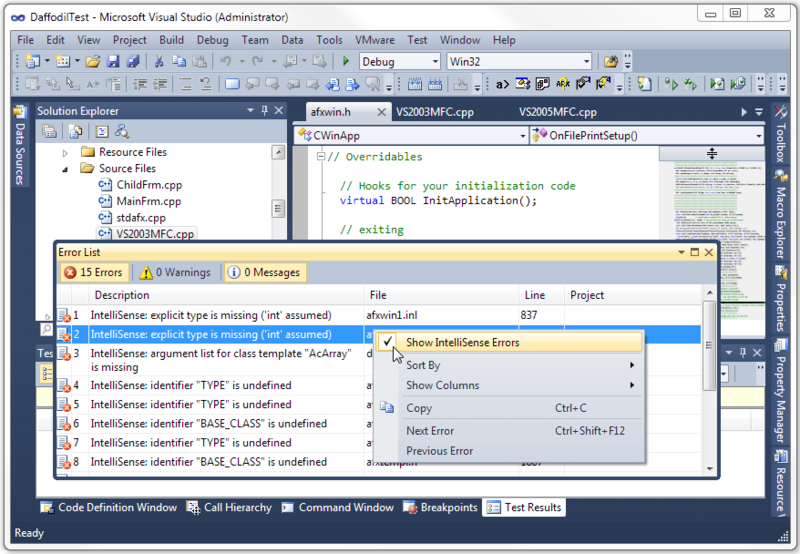 After some futile attempts to script the Visual Studio debugger, I decided to just write my own custom debugger. With my own custom debugger, I could easily write code to decide at runtime which exceptions to ignore and which were of interest. The exception I was interested in always occurred while accessing a memory location that ended in 0x30, so my custom debugger ignores access violations that don’t fit the pattern. I had also planned to see if I could suspend the main thread, detach my custom debugger, and manually attach the Visual Studio debugger when my target exception was triggered so that I could utilize the more advanced VS debugger UI. In the end I never got around to trying the debugger switch because I discovered the problem by simply displaying some relevant details in a simple message box when the target exception occurred. As you can see, I hardcoded the application path and command line, which includes a script file that simply quit AutoCAD after it started. I then used a batch file to run the custom debugger in a loop, thereby starting and quitting AutoCAD each time through the loop. I made this debugger a console app, but it could just as well be a window app. I don’t claim to know anything about writing debuggers; this is just something I cobbled together after doing a bit of searching on the web. I decided to share the code in case someone else runs into a similar debugging scenario. One of the cardinal rules of C++ exception handling is “don’t catch what you can’t handle”. Of course there are always, er, exceptions to the rule, but the basic principle always holds. The consequences of violating the rule are less severe in the .NET world, but even there it’s a good rule of thumb. Back in the old days you needed permission from a deity before you could use catch(…) to catch all exceptions. By the turn of the century, an Executive Order was sufficient. These days I see posts all the time on programming forums that go something like “My plugin crashes when I call ThirdParty::Function(). How can I catch all exceptions in ThirdParty.dll?” Bzzzt. Foolish programmer alert! The .NET framework allows exceptions to be used for signaling, so inexperienced programmers often think that’s how they work in C++ as well. I think this is a case where the less rigorous .NET programming model bleed-over effect has negatively impacted C++ programming. The automatic lisp loader modules (LspLoad.zip on my freebies page) have been updated to add support for AutoCAD 2014 and Bricscad 13 64-bit. The modules are now digitally signed so that AutoCAD 2014 loads them quietly.